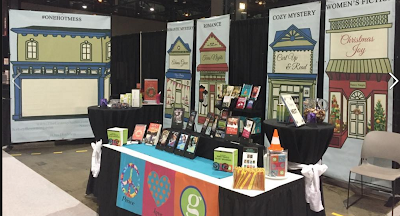 Hey Y'all - Just wanted to send a quick thank you and high 5 for your hard work in helping me get my banners ready for Book Expo America and the BookCon in Chicago last weekend. The booth looked so cute, and readers just loved the small town feel. I've attached a picture so you can see the booth (and you'll notice the peace love grannies on the front of the table that was part of last years display that you did for me). As always, y'all help me put my best foot forward and I love having Banners.com as part of my marketing solutions. Please thank all the folks that worked on this project for me! If you want more information about Nancy Naigle, visit her website. 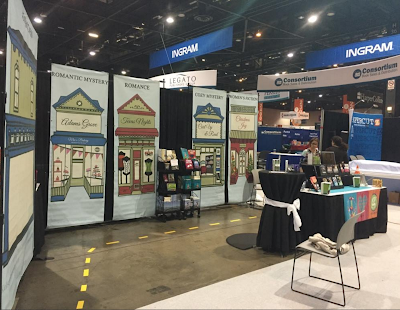 If you want more information about how Banners.com can help you with your booth, contact our customer service staff at 320-965-9300 or visit our website to get started on your trade show banners.